We've been growing and selling our produce locally since 1997. 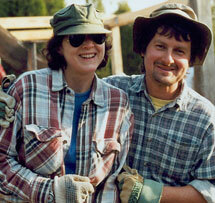 Leslie and I grew our first garden together in 1988, near Freetown, Indiana where she grew up. It was the hottest, driest summer of the decade, but our little vegetable patch thrived, due in large part to the location. It was an area where horses had been kept for years, and all the composted manure gave that ground the fertility and moisture-holding capacity to see our tomatoes, peppers and okra through the drought. This lesson, that good soil will carry plants through stressful conditions, would shape our future growing methods. For five years in the early 1990s, I worked at a farm in Massachusetts, doing everything form picking sweet corn and zinnias to making produce deliveries in Boston. This was a "conventional" (non-organic) farm, and at the time, I had a vague understanding of organic methods as "no spray". I remember one day hearing one of the farm's owners mention how many fewer earthworms the farm's soil had than it once did. I realized how little I understood about how farming methods affect soil health. I started going to the local library to find books on the subject. By the time I left Massachusetts, I knew two things: farming was what I wanted to do and I wanted to do it organically. In the late 1990s, after settling in the Bloomington area, Leslie and I had the opportunity to work with our friends at Meadowlark Farm in Brown County. This was valuable experience at a certified organic operation. By 2001, we were looking for land to buy, to start our own farm.